The world peace day is commemorated every 21stSeptember. 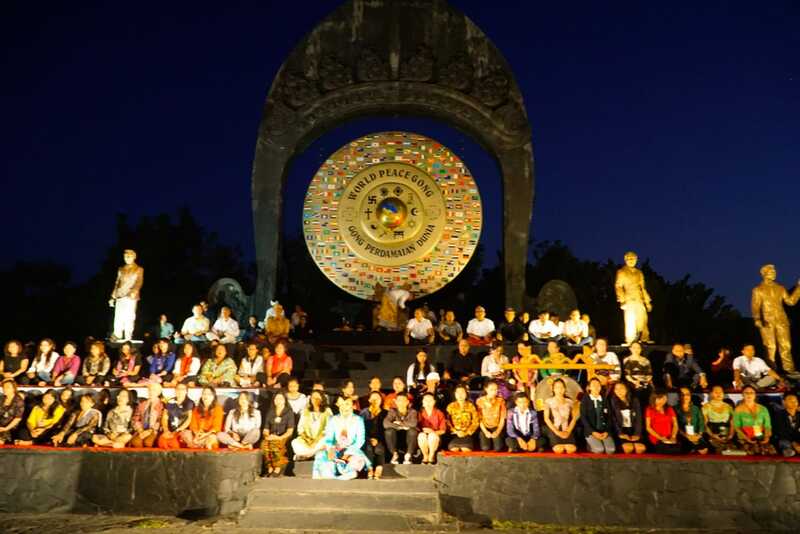 This year, the Bali entrepreneurs commemorated the World peace day by concurrently praying and holding a symposium inTaman Gong Perdamaian Dunia(The World Peace Gong Park) in Denpasar. Attended the event, The Head of Bali Chamber of Commerce and Industry, A.A. Ngurah Alit Wiraputra, SH, MH, The owner of the Taman Gong Perdamaian Dunia, Ir. Ketut Suardhana Linggih, the Heads of the Bali Entrepreneur Association, Dr.dr. I Gusti Nyoman Darmaputra, SpKK., and participants including the high school and university students in Bali. The resource persons at the symposium were Ida Rsi Acarya Waisnawa Agni Budha Wisesanatha, Prof. Dr. I Wayan Ramantha, SE, M.M, CPA, Ak., and Dr. A.A. Tini Rusmini Gorda, S.H, M.M, M.H. Entrepreneurs are those who are not only act as the economy leaders but also human beings who require blissfulness and peacefulness. This statement was stated by the Professor of the Faculty of Economics and Business of Udayana University, Prof. I Wayan Ramantha. Ramantha viewed the three variants of peacefulness and economy, namely: (a) synergistic variants, the value of peacefulness come together with the value of economy; (b) variant of antithesis and dialectics, the value of peacefulness connected to the value of economy significantly; (c) variant of partial-equivalence structure, the value of peacefulness is connected to the value of economy mutually, completely and intensively. He stated that peacefulness requires economic sufficiency since the economic sufficiency will be achieved when there is peacefulness. Every religion must be laden by culture and encompasses various economy ideas. The prosperity and blissfulness of the society will be achieved when the government as well as the entrepreneurs and society collaborates those elements properly. In connection with that, the concept of blissfulness mainly about prosperity, the sense of contentment internally and externally, physically and spiritually, seen and unseen. Dr. A.A. Tini Rusmini Gorda, the head of BKOW (Women Organization Cooperation Agency) of Bali Province emphasized that blissfulness is in link to two main terms namely patience and sincerity. “Be patient to accept all characters and be sincere when my expectation is not in accordance with the hope of most people. Every cloud has a silver lining, we just need to go through this phase patiently and sincerely to create harmony”, she concluded. Whereas, Ida Rsi Wisesanatha, the Steering Committee of the Gema Perdamaian(Echo of Peace) conveyed that our genuine self is not our physical appearance, but our existence at the time we become the owner of our own body as a genuine self. In the soul consciousness, we possess high intelligence and wisdom. When our level of consciousness reaches the soul awareness that is the time when patience, wisdom and sense of understanding taking place. The matter is that we lost the idea that we are the genuine soul itself. There are six wrapper linings or dimensions surrounding our genuine self namely soul, will, compassion, mind and ego, emotions and the external body. First, we must enlighten those things by understanding the rule in nature of each dimension. After recognizing the rule, try to manage them for this is a long journey of human beings even they are being reincarnated repeatedly. According to Ida Rsi Wisesanatha, the composition of consciousness which carries the soul needs to be developed as of we can design our farther steps and appreciate our journey. “A good Dharma (kindness) is a Dharma built upon the recognition of the rule in nature. It is not about memorizing or committing dogma, but investigating each learning resources in order to create aesthetics”. Further explained, orderliness and discipline are the two basic elements to reach enlightenment. Starting with orderliness and discipline, each individual then begins to recognize the dimensions of the body, emotion, ego as well as the compassion for this is the entrance way. In connection to peacefulness we must always be in the level of consciousness. As said by Steve Jobs “Stay foolish stay hungry”, do not find ourselves to be the most spiritual, the kindest and the smartest, thus arrogance will appear yet accusing others as if they are not as smart as us, insisting them to be smart in strange ways. Blissfulness can only be achieved when we respect others as we respect ourselves”, he said.